This attractive West facing cottage with large balcony, mature colourful garden and swimming pool, is elevated to enjoy superb panoramic views over the bay and the vivid evening sunsets. The palm fringed sandy beach is ideal for swimming. This is a prestigious residential location with Marina, mini-market, and restaurant in one direction and 4 restaurants in the other, including the world famous Calabash Hotel. All within 5 minutes walk. Our excellent cook/housekeeper, an essential part of our package, takes the 'self' out of self catering if this is your preference (breakfast, prepared local meal). You can adapt her schedule for getting all the required privacy. The house is well maintained and always upgraded as appropriate. Both bedrooms 'en suite' and with air-conditioning and ceiling fan. We are a Belgian family who is used to work and travel on the 5 continents. Our first visit to Grenada dates back to 1987! After visiting other quite busy Caribbean islands, it was a real surprise to discover a such paradise: the place was charming, and did not changed much since then. We bought Owl Cottage in 2011, after an active search of two years to find the best buy as a holiday and hide away house, in the same time able to be presented for rent for the lucky one's who want to share our choice: Grenada as a perfect holiday destination! In addition to our work and travels, we are also a sailing family, and L'Anse-aux-Epines is a fantastic harbour, where our sail boat drops the anchor quite often since 2009. St. George's, Grenada's capital, is the most picturesque in the Caribbean. Grenadians are welcoming people, and all over the place you will feel a special touch of true Caribbean character. It is a friendly island, still untouched by the commercialism of mass tourism. All stores and services at a few minutes drive. Good airlines connections. Nice beaches. Rain forrest with water falls and bird life. A large choice of sport activities. Quiet and exciting in the same time. True paradise ! Simple and efficient set-up, nice tropical garden, a fresh water pool for your convenience, and the beach at the bottom of the garden. A spectacular view on the bay and its numerous yachts. Nice picturesque sunset every day. The house is on Holidays Rental / Home Away since long, and we have inherited from the former owner the same team to take care of the house, the garden and the swimming pool. They like their job, and know how to welcome and accomodate our guests from various horizons. In each bed room, + ceiling fans. Additionnal fans in living room and on roofed balcony. Well ventilated tropical house. Grenada (known as the Spice Island) is somewhere special for a holiday. The capital - St. George's, is the most picturesque in the Caribbean. It has Tropical Rain Forests with two Peaks of around 3,000ft. There are numerous Waterfalls, and many colourful tropical trees, flowers and shrubs. It is a friendly island with a charm and character of its own, and is still untouched by the commercialism of many of the other islands. Children under six to be watched carefully by parents (swiming pool, balconies). There is a 9-hole golf course nearby. Scuba diving, wind surfing, yacht charters and car hire are all available in the local area. Our family of four visited this lovely cottage. First off, the staff that takes care of the place are great. Sparrow, Ms. Barry and Curtis treat the guests like family and the home like their own. The views from the veranda are spectacular and we enjoyed breakfast and afternoon cocktails from here. The pool is an oasis and we used it every day. The gardens are established and are beautiful. The house is great for a family of four and we were comfortable for our weeks stay. The location on the island is wonderful as it is very close to 4 restaurants and a short drive to all of the places that you want to go. I have no hesitation recommended this place. The only reason I didn't rate it as a 5 star is that the internet is very slow (2 users max online at a time), the water pressure/temperature is very low/too hot in the master shower (it was dry season when we were there) and there was no outside grill/bbq. 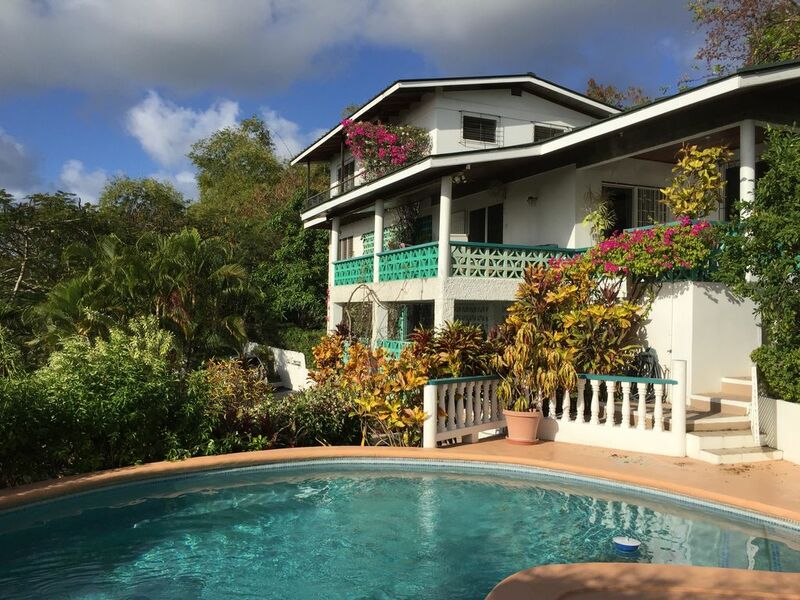 When we visit Grenada again, I hope Owl Cottage is available for us to rent! Great place!!! Charming cottage overlooking the bay. The staff (house keeper, property manager and gardener) was amazing and helpful. We enjoyed the location - very easy to walk across the street to the beach for two different resorts/restaurants. We rented a car and explored the island - such a beautiful island with friendly people. Our kids loved the pool. Great getaway! We highly recommend. We thoroughly enjoyed our stay at Owl Cottage. The view from the porch alone made the stay worthwhile. It was stunning! The cottage was well equipped with everything we needed. Ashley and Greta took care of us the entire week. They are both wonderful. The beach is a short walk down the driveway (steep! We got our workout during the week walking around Grenada's hills) and across the street. We spent a lot of time at the pool too. It was so nice to have a private pool with plenty of shade and the cottage gardens are gorgeous. the marina restaurant had decent pizza. We also took a tour of the island with Ashley which I HIGHLY recommend. He is a native Grenadian who knows so much about the island and he tailored the tour specifically to our needs. We have just recently returned from Grenada and our lovely holiday at Owl Cottage. Having spent years in the Caribbean as professional yacht crew it was great to have a "land perspective" and experience the luxury of being cared for by such a wonderful team. First and foremost, Greta (housekeeper extraordinaire) was absolutely wonderful. She was friendly but not obtrusive and so willing to make our stay as pleasant as possible. The gardener, Curtis, was also very considerate of our private time but was more than willing to answer our questions about the flora and fauna. Ashley was so very helpful in procuring a car, advise, directions, and anything else we needed. It was so nice to have someone waiting for us at the airport after a full day of travel. The cottage is exactly as pictured, and we could not have wanted for anything more. The view in the morning from the porch is unequaled. The chairs are so comfortable that you never want to move. We spent many hours with binoculars watching the birds and the yachts. The beach is right across the street and is beautiful to walk in the morning. The pool is surrounded by bright colorful flowers so when you take a swim its like swimming in a tropical garden. The outdoor shower was great after the beach, with a pretty view too! We did a lot of exploring on the island; tropical rainforest (ask for Nequan who was an excellent waterfall guide) snorkeling, which can be arranged right down the beach at the Calabash hotel, hiking, sailing (Grand Anse Beach). The local market is a wonderful way to see and buy local produce. If you are not familiar with Caribbean markets they are not like our farmers markets in the States but worth the visit. We found almost all of the local people to be very friendly and helpful; avoid St. George when the cruise ships are in, its much nicer and calmer and the hawkers are less aggressive. We ate at some lovely restaurants, La Sageese is just wonderful. The cottage is well situated, close to restaurants (The Junction is very fun!) and a short drive into St. George. We traveled with our 16 year old daughter and she had a wonderful time. We all three felt very connected to the island, and were very sad to leave. Owl Cottage and Grenada are very special places on Earth. Spectacular view, perfect pool, short walk to beautiful beach, authentic Caribbean house...what more could you ask for! We returned to Grenada after 20 years (too long) and Owl Cottage was a perfect fit for 4 of us. Sitting on the porch for breakfast and then evening cocktails, with the view over Prickly Bay...aaah.The beds were very comfortable, AC, a fan, and louvre windows for the breeze, large bathrooms, with good showers. We were very impressed with the pool which has a 'stand on' ledge all around, plenty of patio furniture, lovely shade from a pergola and outdoor shower. Even though we travelled all over, I never saw a more beautiful property...the colors, textures and variety of the vegetation were exceptional. Even though Grenada is more built up this area is non-touristy. L'Anse aux Epines beach is across the way and 20 years later the beach is still lovely and quiet. The Little Dipper is tiny, Grenadian and cheap with a spectacular view...Charcoal is near the cottage, great fish sandwich and they deliver...The Aquarium is in a fantasy setting on a lovely beach...Coconut Grill at night, tables in the sand, the sea just feet away. If you go just one place for the day, make it La Sagesse...great food and a charming cove beach. Owl Cottage was quite a find. We loved it. We were very lucky to have such charming guests who were having a reunion. They were 4 ladies from various parts of America and obviously were well travelled with lots of places to compare to Owl Cottage and Grenada. Their review is typical of how most people feel about their holidays with us. I was lucky to meet them for one day as I was still in Grenada when they arrived. This does not happen often. Welcome to other guests looking for a special holiday. did, using both bedrooms. The space in a 'proper' home, as opposed to a 'bedsit', is such a joy whilst on holiday. Greta, our housekeeper, and Ashley our Manager/car rental, both enjoy looking after guests as you see from the review. The local roads in Lance Aux Epines are good, but not fully shown on the map. Owl Cottage is just 50 yards from the palm fringed, golden sand beach. It is only a short walk to the Calabash Hotel, along the beach. Also nearby, within 5 minutes walk, are 4 other restaurants including the renowned Red Crab and the Boat Yard at Prickly Bay Marina with happy hour, music nights and mini-market. Supermarkets, banks and the famous Grand Anse Beach are just 5 to 10 minutes drive away. Rates include pick up and drop from / to airport. We do not include the usual 10% service charge, so tipping our housekeeper Greta is appropriate if you are happy with her. Greta is a gem, and tries to make everyone's holiday special. Our views are truly spectacular. Although you are just by the beach, the swimming pool is "right there" to totally chill out by (under the shade provided if needed).